This is the most amazing tree that you'll ever see. This tree looks like it's a scruffy little scrub tree living in a wasteland. Well, it's not. Not really. It's actually 13 feet tall. And it lives in Sweden. So, while it is living in the tundra, it's not really a barren wasteland. At least, the Swedes don't think it is. So, what is it that makes this scruffy little spruce so amazing? It's not that good looking of a tree.It's very sparse. It looks like it's on it's last legs. Well, say hello to Methuselah. 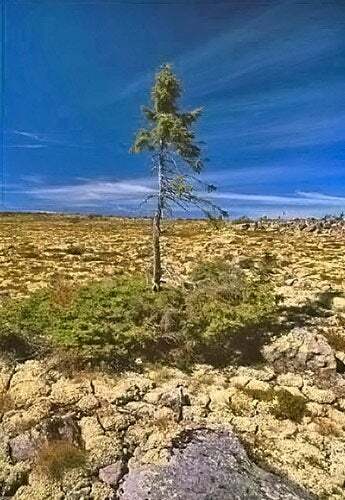 Methuselah is a Norway Spruce that was discovered in 2004. And while it doesn't look like much, the amazing part of this tree lies below ground. The current portion that is visible above ground is only about 60-70 years old. You'll notice I said current. That's because trees will grow multiple trunks out of the same root system. And that's what this one has done. For the last 9,550 years. So while there are several trees in the 3,500 - 4,000 year range all over the world, the one in Sweden has the oldest root system. It sprouted from a cone shortly after the last glacier receded from the area. And for the last, almost 10,000 years, it's roots have been extracting moisture and nutrients from the soil to feed the trunks it sprouts. I'll tell ya, makes my 45 not seem so bad anymore.